News and such from my life! On Thursday of last week one of my dreams finally came true, my custom fly rod from JP Ross Fly Rods arrived. After watching the UPS guy drop it on the ground twice I waited with bated breath as he brought it inside the office and prayed JP wrapped his products well. As I opened the box my hands shook with anticipation of not only the fly rod but the ‘goodies’ that JP had said were in the box. The following photographs were taken at the Blackfork Inn in Loudonville, OH, my favorite Bed & Breakfast or onsite fishing! The above picture features a JP Ross hat (an awesome piece of swag), a size 16 Blue Winged Olive CDC Thorax Dun, and a one of a kind item. Because some of my novels and short stories feature Knights Templar, JP was able to hand draw the shield that was designed for my first novel on to the cap for my rod tube. No one else will have this item and I love it. The quality of this rod was so far above and beyond what I expected I can’t even begin to rate it. The components are exceptional, JP as a person and builder is exceptional, and the overall look and feel are truly exceptional. If you are going to have a custom rod built, do yourself a favor and check out JP Ross Fly Rods before you pull the trigger. Selection and pricing is incredible along with their customer service. At one point JP emailed me to apologize for taking so long but he was nervous about hand drawing the shield on the end cap but he wanted to make sure it was perfect. Overall I’d give this rod a 10+ out of 10 (though I hate rating it). Wonderful job JP and I look forward to getting another one someday! We’ll have to hook up for some fishing up there one weekend! STAY TUNED FOR THE FINAL PART OF THIS REVIEW ‘A NEW FLY ROD: PART 3 – FISHING’! As you have seen from the posts I’ve had a rough two years. The last event was my mother’s passing in December. One of our last conversations together was about me fishing since my family had always been into golf. She said that she understood why I had given up the game but was curious as to why I had chosen fishing. I explained that it wasn’t so much about catching a fish and that in all honesty that was a perk, but it was being out in nature away from modern society. The ability to see wildlife in it’s natural habit with no computers, tv’s or radio was very alluring. She was so happy for me for having found something that actually brings me some modicum of peace. One of that last statements she said to me was to never stop fishing as long as it brought me joy. That was the point where I decided to purchase something special. I had rods and the kayaks but now it was time for something really out of the ordinary, a custom fly rod. I shopped around and talked to friends, read books and did my general research. At first I was going to purchase a custom bamboo rod until I really thought about the price tag. For a good custom bamboo rod it would be around $3000. A little steep in my book. 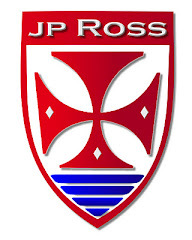 I finally stumbled onto JP Ross Fly Rods and became entranced. The first thing that tickle my interest was his use of the Templar Cross in his logo and the explanation of that cross located on his website at http://jprossflyrods.com. I investigated the type of rods he makes and found one that tickled my fancy, The Beaver Meadow. This was a small stream and creek rod that would be perfect for trout and smaller smallmouth bass here in Central Ohio. The pricing can’t be beat either! JP makes a 5’ 2wt fly rod that is almost unheard of! One of the things that Beth and I have been seriously consider is traveling into the Appalachians and Adirondacks to fish native trout and this rod is MADE for that! As for the details of the rod and my experience working with JP, I’ll be reporting that in the second part of this three part series which will probably be released tomorrow night. Nearly two and a half years ago I lost my father to cancer. As you can imagine this was a very traumatic event but what made it worse for me was that my father and I hadn’t become close until later in our lives and that was cut short. Watching my father waste away over a period of five to six days was horrible. It opened a very deep wound inside my soul knowing that my dad would not be there for me anymore to share in laughter and sadness. At this point I finished my first novel, Faith & The Undead and took care of my Mom who was not familiar with taking care of herself. My Dad had done that for her and unfortunately masked much of the dementia that my mother was experiencing. Not much later my wife and I split making me a single father of an adorable baby girl who I love very much. Through out everything she has always been my shining spot of joy. Without a house I had to find someplace to lay my head and my dear friend Beth LaFond stepped in making that possible. I now had a roof over my head and someplace for my daughter to visit and stay. But as with anything life struck again. My mother had a fall where she laid on the floor for what we now think was roughly thirty plus hours in her townhouse. She spent nearly two weeks in the hospital and then about three more in rehab. Knowing that she could no longer live on her own my brother, sister, and I made the decision that Mom needed assisted living. This worked well for a little bit but the dementia/Alzheimer’s struck with a vengeance causing my mother’s body to forget how to chew and swallow food. Doctors weren’t sure what to do and one day a nurse from the assisted living facility called me in tears because he didn’t know what he could do to help. I asked him to call a squad and I’d meet my mother at the ER. After nearly getting arrested for going after a very stupid (I do NOT use this term lightly) physicians assistant my mother was admitted to the facility where we learned of the Apraxia that had developed in relation to swallowing. With a mother who had very few lucid moments my siblings and I discussed amongst ourselves that options that the doctors provided: a feeding tube or no feeding tube. We read through my mother’s living will multiple times and worked with the staff in the Palliative Care section of the hospital to determine that my mother did not want the tube. After reaching this conclusion luck would have it that Mom became quite lucid for a day and was able to tell us multiple times that she didn’t want the tube. Off to hospice we went where it took roughly three weeks for my mother to pass to the other side into my father’s arms. Many times I thought I felt my Dad in the room with us waiting for Mom. Now I am alone in Columbus, OH. Just me and my daughter. The only blood family I have here. I’m close to my two siblings but they live down south and we just don’t get to see each other as often as we’d like. Through all this I quit blogging (mostly), quit my podcast (completely) and haven’t written a damn thing. I have so many wonderful stories started that now collect dust on my desk. I wish I could finish them because I want to share them with you so much. I guess this turned out to be more of a factual confession that I expected but for those of you that didn’t know what was going on or where I disappeared to, you now do. Severe the head or destroy the brain!!!! The Interview Part 1: Where have you been? Me: (the leather arms of the chair creak and my knuckles whiten as I tighten my grip and lean forward doing my best Bela Lugosi as Dracula face) I AM THE LORD OF ALL THAT IS FISHING! Me: (Looking around sheepishly) So your saying I should be somewhat serious? Snagatree : It wouldn’t be a bad idea. Snagstree: How about an IC Light? Snagatree: So Mr. Rogers where have you been for the past few months? Me: First of call me Ben and secondly, I just took some time away from life to heal some personal wounds. Snagatree: Does that mean you haven’t been fishing? Me: I’ve been getting in some time on the water here and there catching Bluegill and Bass. Snagatree: How many fishing poles do you have? Me: Kinda racist isn’t it? Why do they have to be Polish? Why not Welsh or Czech? Snagatree: Rods, Ben, I mean fishing rods. Me: Oh. Sorry about that. I have two baitcasters, 2 spinning combos, and 4 fly rods not including a few antique rods and reels. Me: I took a class in the Navy once called ‘Tools and their uses’ and that applies here. Each rod is used for something different. Snagatree: So back to the question, where have you been? Me: I told you I was healing and I was actually also moving. Snagatree: Did you do any writing? Me: Nope. I’ve been very busy with unpacking and the move and a lot of other fun stuff. I hope to get back to writing in the near future. Even if I did give up the pen eventually I’d like to finish all my manuscripts first so I’d walk away having completed what I started. Snagatree: So you’ll continue writing? Me: I have every intention of writing again within the next couple months. Snagatree: How about a sneak peek at the projects you’re working on? Me: Azrael: Burning Rain from KnightWatch Press and probably the second book in the Trilogy of the Undead or How Fishing Saved My Life (or Jonah and the Largemouth Bass). Dude, you got any more beer? I have a feeling you have a few more questions….